To their 30th anniversary Airline Company Croatia Airlines decided to make rebranding and repainted entire fleet that at present moment consists of two airplanes Airbus A320, four Airbus A319 and six Bombardier Q400. It worth to mentions that colour palette hasn’t changed however the logo Croatia was enlarged making it even more noticeable. 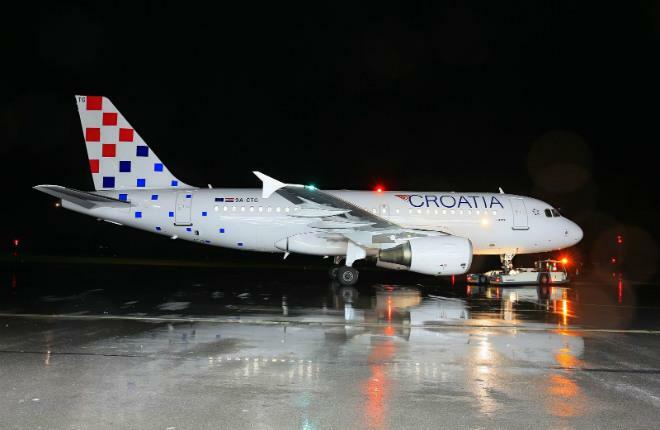 Besides Croatian symbol šahovnica red and white squares embodied on the tail – recognized element of national identity – has expanded on the airplane’s body. Visual elements can also be noticed on the lower part of the airplane that became white now (earlier the airplane’s bottom had blue colour). First flight of Croatia Airlines Airbus A319 with aircraft number 9A-STG was repainted in Czech Republic in Ostrava International airport (OST). This year Airline Company plans to repaint three airplanes Bombardier Q400 and three Airbus A319. Other aircrafts from the company’s fleet will be repainted next year. Airline Company Croatia Airlines was founded in 1989 and initially it was registered as Zagal (Zagreb Airlines). One year later the name was changed to Croatia Airline and the carrier acquired status of national.